Patrick Ronayne Cleburne, the son of Dr. Joseph and Mary Anne Ronayne Cleburne, was born March 17, 1828. At the age of twenty-one he immigrated to the United States. He settled in Helena in 1850. Patrick Ronayne Cleburne was born into an Irish Protestant family of high social standing. His father was a prosperous doctor in County Cork and young Patrick received an enviable education. When Patrick was fifteen, his father died. Against his wishes, Patrick was apprenticed to a doctor. He cared little for medicine and in 1846, he failed the exam for entrance to the Apothecaries' Hall. Humiliated, Patrick joined the British army. For three years he suffered the miserable life it afforded enlisted men. 2. 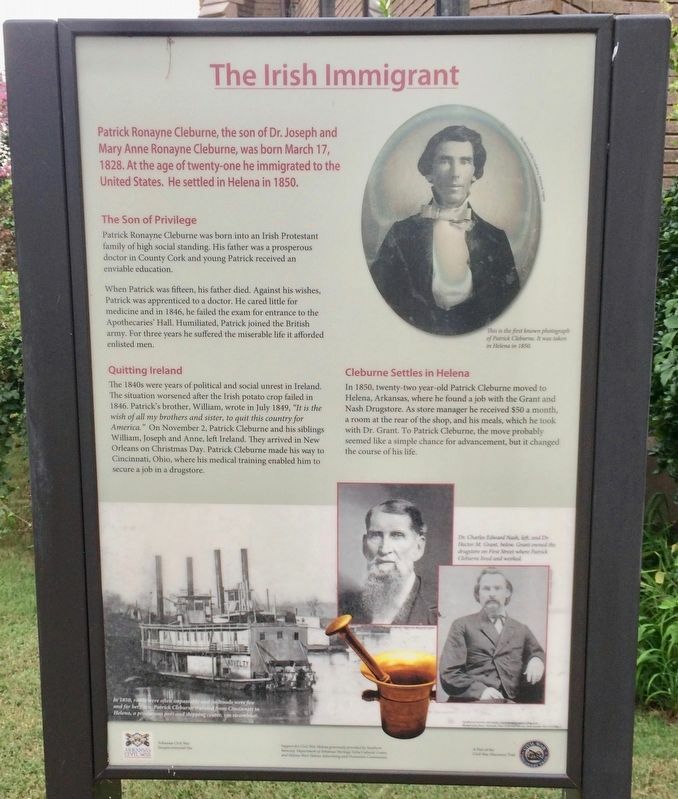 The Irish Immigrant Marker is the nearest one to the statue of Patrick Cleburne. 1840s were years of political and social unrest in Ireland. The situation worsened after the Irish potato crop failed in 1846. Patrick's brother, William, wrote in July 1849, "It is the wish of all my brothers and sister, to quit this country for America." 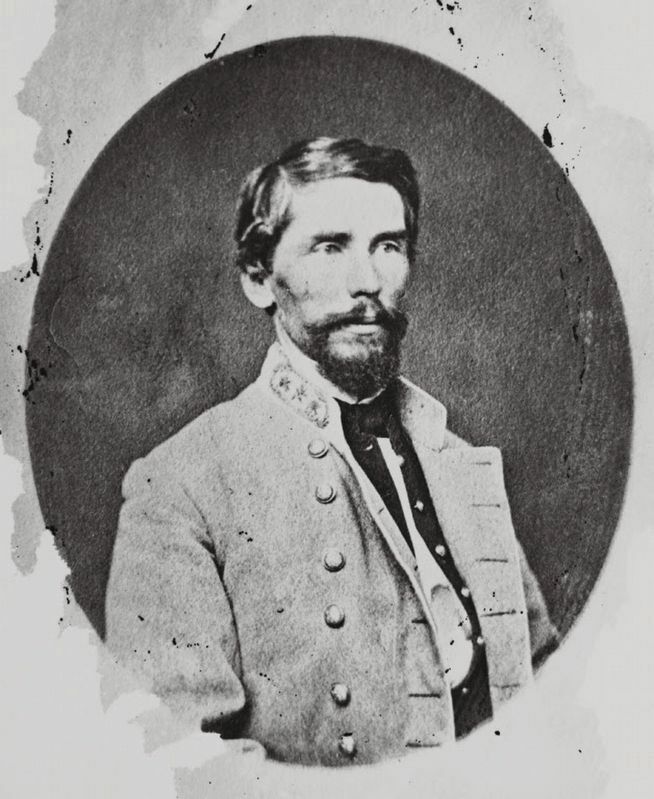 On November 2, Patrick Cleburne and his siblings William, Joseph and Anne, left Ireland. They arrived in New Orleans on Christmas Day. Patrick Cleburne made his way to Cincinnati, Ohio, where his medical training enabled him to secure a job in a drugstore. 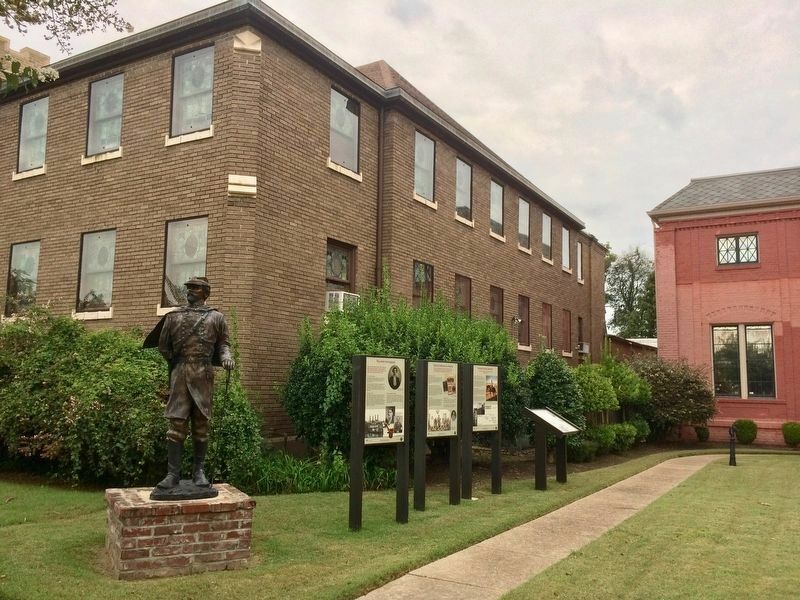 In 1850, twenty-two year-old Patrick Cleburne moved to Helena, Arkansas, where he found a job with the Grant and Nash Drugstore. As store manager he received $50 a month, a room at the rear of the shop, and his meals, which he took with Dr. Grant. To Patrick Cleburne, the move probably seemed like a simple chance for advancement, but it changed the course of his life. Bottom left: In 1850, roads were often impassable and railroads were few and far between. Patrick Cleburne traveled from Cincinnati to Helena, a prosperous port and shipping center, via steamboat. Bottom right: Dr. Charles Edward Nash, left, and Dr. Hector M. Grant below. Grant owned the drugstore on First Street where Patrick Cleburne lived and worked. Location. 34° 31.711′ N, 90° 35.319′ W. Marker is in Helena, Arkansas, in Phillips County. Marker can be reached from Pecan Street south of Perry Street, on the right when traveling south. Touch for map. Located next to the Helena Museum of Phillips County. Marker is at or near this postal address: 623 Pecan Street, Helena AR 72342, United States of America. Touch for directions. Other nearby markers. At least 8 other markers are within walking distance of this marker. Patrick Cleburne in Helena (here, next to this marker); General Patrick Cleburne (here, next to this marker); Phillips County's Confederate Soldiers (here, next to this marker); The T-33 Shooting Star (within shouting distance of this marker); The American Legion Hut (within shouting distance of this marker); "We are all the same as dead men" (about 300 feet away, measured in a direct line); Arkansas' Mercí Car (about 400 feet away); Judge Jacob Trieber (about 400 feet away). Touch for a list and map of all markers in Helena. More. Search the internet for The Irish Immigrant. Credits. This page was last revised on October 22, 2017. This page originally submitted on October 21, 2017, by Mark Hilton of Montgomery, Alabama. This page has been viewed 121 times since then and 9 times this year. Photos: 1, 2, 3. submitted on October 21, 2017, by Mark Hilton of Montgomery, Alabama.